Apios is a member of the leguminosae family. Contrary to more known species of this family ( beans, peas, asparagus pea,…) the pods aren’t eaten , but the edible parts are the tubers. 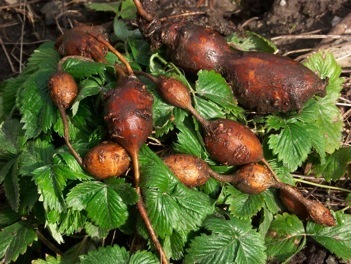 These tubers appear as some sort of swellings on long rhizomes in the ground and can be used as a potato substitute, with a chestnut taste. Apios thrives very good in Western European conditions. They prefer a sunny place, a little bit of shade doesn’t seem to harm them though. Make sure the ground stays wet (permaculture? ), they don’t like really dry conditions. Plant the tubers immediately after arrival, don’t let them dry out! If your ground is frozen,put them in a pot with some potting earth or something similar and keep them wet. Space the tubers in full ground 50x30 cms and place a sturdy support (2 metre or more) right next to every tuber. 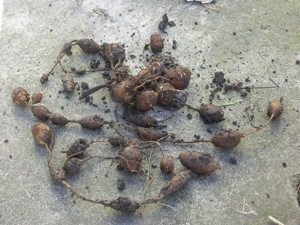 Plant the tubers 7-8 cms deep. In summer, they will wind themselves along the supports, in ideal conditions plants reach over 3 metres , although they can be slow to appear (sometimes even only in May). 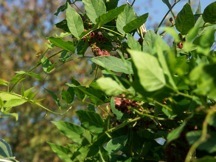 The plants like a bit of food, but ,as a member of the leguminosae family , they are not greedy and will grow well without heavy fertilization. Harvest begins whenever the leaves have died , usually around October, after flowering. The tubers can be left in the ground during wintertime, they are hardy, in my experience to at least -11° Celsius (I didn’t have a chance for testing lower temperatures, winters have become very mild). If you decide to dig them up,place them in a box of wet ground or sand or… ,keep them cool and moist. Again, don’t let them dry out or they will shrivel and become useless. Bear in mind that every over-wintered tuber is likely to produce a new plant, so this can become a wide –spaced apios patch if you just let them go. 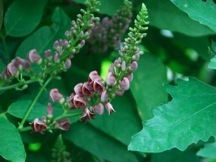 There are a few selections of apios, but they are not commonly available in Europe, the plant originally comes from North America and was once an essential food for native people and the first settlers. It is gaining a new interest lately as a potato alternative, some Universities are selecting on bigger crops and bigger tubers (tubers over here become at the most 8-9 cms long and 3-4 cms thick. Small tubers will grow big within two years, if they have the right conditions. They can be prepared the way potatoes are prepared : boiled, fried , ….